Highlight to Wikipedia is my first Chrome app that i coded end to end. It was very enlightening to start from scratch and build up an app step by step (versus hacking existing apps which is what i normally end up doing). Highlight to Wikipedia makes looking things up in Wiki super easy. 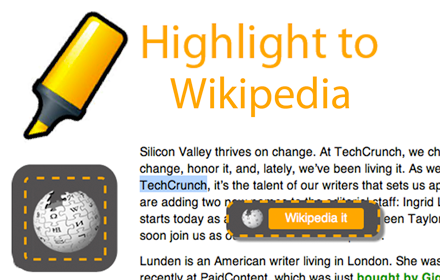 Just highlight any text on any webpage and a convient "Wikipedia it" button pops up right there. There is also a second flavor of the app that makes highlights search Bing instead of Wikipedia.